Air conditioners are rated by Seasonal Energy Efficiency Ratio (SEER) numbers. The higher the SEER rating on a unit, the more efficient the system is. Systems installed 5 – 10 years ago, might operate at a 6.0-7.0 rating, while today’s generation of heating and air conditioning offer energy SEER ratings up to 18, the highest in the industry. The federal government has mandated that beginning in January 2006, all new systems must have a rating of at least 13 SEER. It may cost you up to 40% more to operate an older system with a low SEER rating, even if the unit has been trouble free. With today’s rising energy costs, many individuals are replacing their HVAC equipment to ensure they are paying for the most energy efficient and cost effective systems available. Our design specialists are educated in the most current methods of design engineering. Each system is designed to provide maximum comfort for your business at every efficiency level, but we’ll never try to sell you more than you need. You get the right system to meet all your comfort needs. This knowledge combined with over 25 years in business operation and over 15,000 customers places us in a unique position to be of service to you. Benson’s offers free estimates to recommend the unit that is best for your home. We’ll evaluate your house and input data into our sophisticated computer software program to properly size and select the right unit for you. After a new system is installed our technicians will thoroughly test the equipment to ensure the unit performs as promised. Your service needs are met by factory trained technicians who operate from fully stocked trucks. A computerized dispatch system routes your service call efficiently and effectively. Our warehouse has a computer controlled inventory of parts and equipment to ensure our commitment to quality service. Warranty and Energy Service Agreements provide peace of mind to our many customers. A 24 hour service line means that you can count on us to be there when you need us. 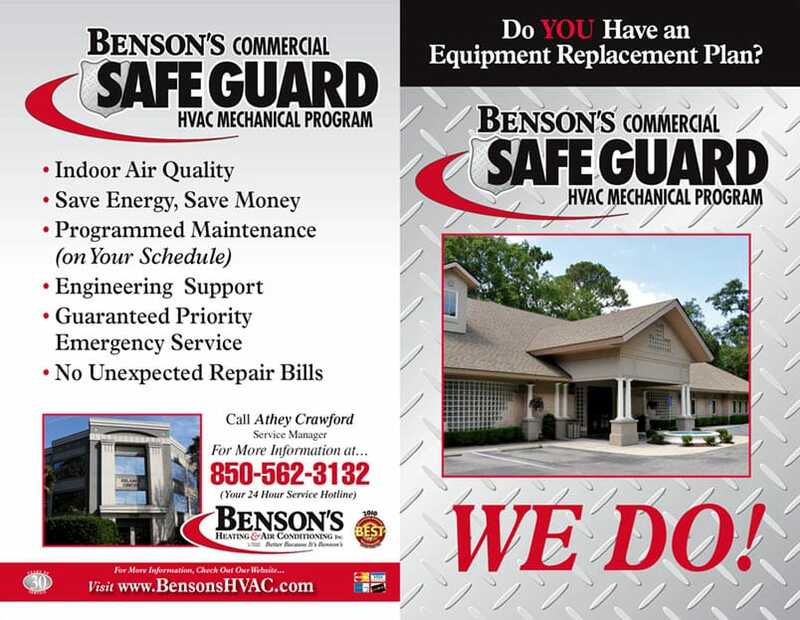 Whether you need scheduled service, emergency repair, replacement equipment or a total system, you can depend on Benson’s Heating and Air Conditioning, Inc.
Benson’s Heating and Air Conditioning, Inc., is an industry leader in the application of new technology. We utilize the latest computer aided design, advanced communication technology and state of the art heating and cooling systems. With innovative technology, our goal is to give you control of your environment and to provide you with efficient year round comfort. Click here to view some of our Commercial Projects.